The Roanoke Voyages were attempts by Sir Walter Raleigh, under his 1584 patent from Queen Elizabeth I, to establish an English colony in the New World on the coast of present-day North Carolina between 1584 and 1590. The first of these voyages was led by two explorers in Raleigh's employ, Philip Amadas and Arthur Barlowe. On 25 Mar. 1584 Raleigh received a charter from the queen to explore and settle "remote heathen and barbarous lands." Less than a month later, on 27 April, Amadas and Barlowe set out on two ships for the coast of America. They surveyed the Outer Banks and sounds, learning from the local Indians they met that the area was known as "Wingandacoa." After approximately six weeks of discovery and trade, they returned to England with two of the inhabitants of Wingandacoa, the Roanoke Wanchese and the Croatoan Manteo. Barlowe's glowing report of the newly explored land encouraged Raleigh to attempt a settlement the next year. In January 1585 Raleigh was knighted by Queen Elizabeth and his American possession of Wingandacoa was renamed "Virginia" in honor of the "virgin queen." In April Raleigh sent a seven-vessel fleet commanded by his cousin, Sir Richard Grenville, to establish an English colony in this new region. Grenville explored the Indian towns of Pamlico Sound before deciding to plant an English settlement under Ralph Lane on Roanoke Island. Lane's men built a fort and dwellings on the island, where they remained for almost 11 months. During their sojourn in Virginia, these colonists advanced English explorations to the southern part of the Chesapeake Bay and up the Roanoke and Chowan Rivers. They also cataloged and scientifically tested the commodities of the Native Americans and the natural resources of the region, although they did not discover any source of valuable metals in the Coastal Plain before returning to England in the spring of 1586. In 1587 John White, an artist in the Grenville expedition of 1585-86, led approximately 150 men, women, and boys to establish a colony in Virginia under a charter from Raleigh. Reluctantly, White ordered the settlers to establish themselves in the town abandoned by Lane. There, on 13 Aug. 1587, the friendly Croatoan Indian Manteo was baptized and made Lord of Roanoke and Dasamunkepeuc by order of Raleigh. On 18 August the colony noted the birth of Virginia Dare, the daughter of colony leader Ananias Dare and his wife Eleanor (the daughter of John White) and the first English child born in the New World. A few days after Virginia's christening, White sailed back to England to encourage and accelerate plans to resupply and reinforce the colony. His departure marked the last known contact between the English and the famous "Lost Colony." When White returned three years later, he found no colonists and only remnants of the structures they had built. 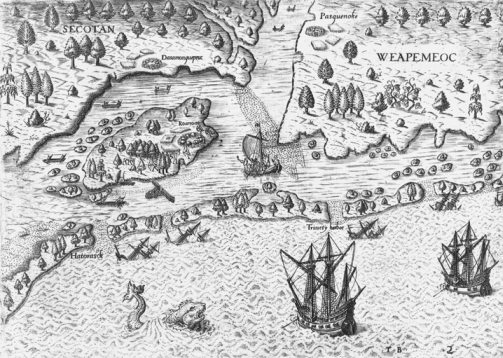 Although Raleigh was unable to establish successful English colonies in America under his 1584 charter, the Roanoke voyages and colonies were valuable precursors to the eventual formation of a permanent English colony at Jamestown, Va., in 1607. The experience and knowledge gained by the English in the 1580s served as an important foundation for later efforts to establish colonies along the coast of North America. Ivor Noel Hume, The Virginia Adventure, Roanoke to Jamestown: An Archaeological and Historical Odyssey (1994).